The other day a woman on a parents’ list I’m on posted that her store was accepting donations of toys to be taken to kids who’s homes burned down in the Tahoe area last week. This was perfect timing for us, as we had several HUGE boxes of toys and puzzles that I didn’t have the energy to list for sale. The effort involved to make a few extra dollars didn’t add up for me. So, I asked the kids what they thought of bringing the toys to her instead (I’d promised them the proceeds of the sale). They were all for it. Yay! To make up a little for their sacrifice, and it was a sacrifice mind you — they had drastically purged their collection to just the things the really, truly loved — I gave them a budget of ten dollars each to buy whatever they wanted in the store. It took about an hour of hard decision-making, but my boy finally fell upon a magician’s bag of tricks which he LOVES. 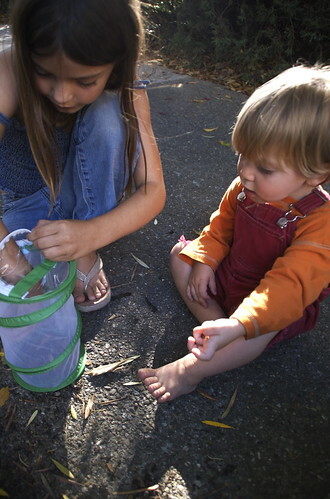 My girl chose a bug catcher. Yep. A bug catcher. It’s a mesh pop-up thingy that zips up closed to keep her new-found critters. All three kids have spent hours (hours, I tell you) this week, hunting and observing Roly Polies. We’ve even been online to learn more (here, and here). So far, many (many, many!) females have been found, but no such luck with the males. The kids have grand plans that the creatures will fall in love, marry, and make more critters (shiver).